Bioaccumulation is the accumulation of contaminants by species in concentrations that are orders of magnitude higher than in the surrounding environment. zooplankton magnify the PCB concentration. 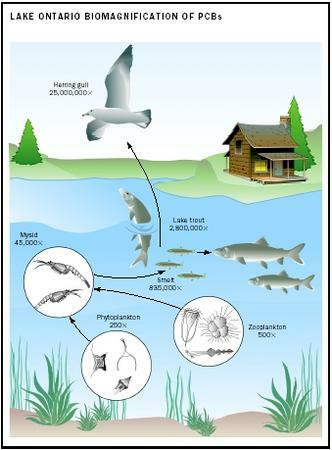 This leads to bioaccumulation factors as high as 2.8 million in predatory fish species such as lake trout and striped bass. Mammals—including humans that eat the fish, reptiles, and birds—further accumulate PCBs. Finally, in the leading predators among marine life—the seal and polar bear—PCBs and other persistent organic pollutants (POPs) reach concentrations that cause obvious impairments of the immune and reproductive system. A significant proportion of these accumulated contaminants is transferred to the offspring by the mother's milk, resulting in, for example, abnormal sexual development, behavioral dysfunctions, and cancer. Prerequisites for a substance's strong bioaccumulation are its affinity for fat and low biodegradability, or persistence in the environment. Bioaccumulating contaminants thus far identified are the first-generation organochlorine pesticides (e.g., DDT, chlordane, and toxaphene), PCBs, dioxins, brominated flame retardants, but also some organo-metal compounds, for example, methyl mercury and tributyltin (TBT). Because of their strong bioaccumulation and toxicity, some of these substances were banned in North America and Western Europe after 1970. The bioconcentration factor (BCF) often serves as a trigger for the hazard classification of chemicals. In the European Union a BCF greater than one hundred leads to a substance's classification as "dangerous to the environment." The U.S. Environmental Protection Agency (EPA) uses a BCF of greater than 1,000 for environmentally harmful substances. In Canada chemicals with a BCF greater than 5,000 are recommended for "virtual elimination." SEE ALSO DDT (D ICHLORODIPHENYL TRICHLOROETHANE ) ; M ERCURY ; PCBs (P OLYCHLORINATED B IPHENYLS ) ; P ERSISTENT B IOACCUMULATIVE AND T OXIC (PBT) C HEMICALS ; P ERSISTENT O RGANIC P OLLUTANTS (POPs) ; P ESTICIDES . Beek, Bernd. (2000). "Bioaccumulation: New Aspects and Developments." In Handbook of Environmental Chemistry, Vol. 2: Reactions and Processes, Part J, edited by Otto Hutzinger. New York: Springer-Verlag. Colborn, Theo; Dumanoski, Dianne; and Myers, John Peterson. (1996). Our Stolen Future. New York: Dutton. Connell, Des W. (1990). Bioaccumulation of Xenobiotic Compounds. Boca Raton, FL: CRC Press. "Bioaccumulation and Biomagnification." Available from http://www.marietta.edu/~biol .